Alyx Dellamonica writes novels and short fiction. Her work has appeared in Isaac Asimov's Science Fiction Magazine, SciFi.Com, and Realms of Fantasy. Her first novel Indigo Springs was released in October 2009. She lives in Vancouver, British Columbia with her wife Kelly Robson and is hard at work on the sequel to Indigo Springs. Jory Mickelson: I am currently reading an essay by Durs Grünbein in Poetry Magazine where he talks about the questions that writers are always asked after a reading. He states that the question, "How long have you been writing?" is really a search to see what made someone into a writer. Do you feel that you were inclined to write from early on or were there factors that shaped you? 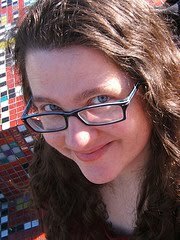 Alyx Dellamonica: Writing is very much something I am compelled to do--if I go more than a few days without writing fiction, I become restless and unhappy. This began, for me, in early childhood. I wrote my first Doctor Seuss-inspired doggerel when I was five. As a kid, I wasn't a gifted athlete or especially graceful socially. The first thing I learned to do at all well was read, and I ran with it, as fast and as far as I could. Does that mean I think it was all nature, no nurture? No. My surroundings in those years utterly reinforced my bookish tendencies. My parents were deeply involved in Community Theater and were producing shows for adults and kids. My home was full of books and scripts, actors and singers. It was a very arts-identified atmosphere. I have trouble imagining what it might have been like to grow up among people who were actively hostile to creativity, or even one that was simply focused on elsewhere... say, on becoming a dentist, or serving a church community, or being outdoors-y. JM: I know that you sing in the Vancouver Lesbian and Gay Choir. Do you feel that singing has informed your writing? And conversely, has your writing given you any insight into singing? AD: I haven't written anything long with choral singing in it (though I've had a novel idea on the back-burner for awhile that would use this experience, if I ever manage to write it.) VLGC are among my biggest supporters--they sang at my November book launch--and they are an inspiration. Indigo Springs has a bisexual main character whose mother is a Trans man, and I think they're both more convincing, as people, because I get to spend time with this wonderful, diverse group of singers. My other artistic pursuits do creep into my writing, definitely. I have written about photography, and I've written a couple stories about my having been in a concert band, in high school--there's "The Riverboy," for one. I've also just finished the draft of a book called Daughters of Zeus, which is set in a small-town community theater company based heavily on the acting and technical theater I did in the Seventies and Eighties. I love learning new things, and weaving those new experiences into my writing is a form of research I particularly enjoy. JM: Rebecca Brown said that her nonfiction essays were the justification for her obsessions. She said it became "research." Do you listen to music when you write? Did your novels have soundtracks as you write--any CDs or artists that helped you enter into the space you write from? AD: The sequel--and the two books I've drafted since--definitely have a soundtrack! I do almost all of my draft-writing and a good chunk of my revision at Cafe Calabria on Commercial Drive in East Vancouver. It's a big, noisy family business with lots of writers and no Internet, and the music is programmed by the patriarch of the family that owns the place, Frank Murdocco. Frank is from Italy, by way of Montreal. He speaks half-dozen languages fluently, and he loves to make mix CDs. He favors Italian pop, including cheesy covers of well-known pop songs (think ABBA or the *Grease* soundtrack, in Italian), French chanteuses, obscure Fifties rock and roll, a bit of country, and the occasional pop rendition of an opera classic, like "Va, Pensiero." You never know what you're going to get at Calabria. You can walk in to comfort music, something like Ben E. King's "Stand By Me," and ten minutes later Joe Dolce will be bellowing "Shaddup You Face" or Dalida will croon "Ti Amo" at you. Or some unrecognizable tenor will sing something simply gorgeous and heartbreaking. I've made some great musical discoveries there, though it's sometimes hard to identify the songs--for some reason, Frank will rarely tell you who you're hearing, and his sons claim not to know. As I type these words, he's playing a French version of Kenny Rogers' "Lucille." About a year ago, it looked like I might move away from Vancouver, and I immediately started assembling a Calabria mix--I was that worried that I might not be able to function without my random cafe tunes. I rarely write to any of my favorite bands, the material I think of as "my" music. I find it draws too much of my attention, because part of me is trying to actively listen to it. JM: The Cafe sounds like a lot of fun; I love the Commercial Drive neighborhood. Your book Indigo Springs features a bisexual main character and a transgendered character. The sci-fi and fantasy genres have traditionally been set within heterosexual paradigms. Were there any challenges for you in creating these characters or the world in which they interacted? Also, who do you think handles queer characters and ideas well in the sci-fi and fantasy genres? AD: I didn't have much trouble with Astrid's sexuality or with Ev's transition, really--they seem very much like so many of my friends, or people I've, to some extent, been. I'm further from my comfort with other subcultures--Olive is a practicing witch, Patience is one of the last survivors of a (fictional) First Nations band, and the military world of Colonel Roche is very far from my day to day existence. Giving these characters authenticity was a lot harder, for me, than writing about a bisexual gardener or a working-class Trans guy. One book I'm currently in love with is Elizabeth Bear's Carnival, which reunites a pair of guys whose relationship fell apart because of heterosexist politics in a very creepy and well-realized far-future universe. It's messy and complex and heartbreaking, a really terrific book. Jo Walton's Small Change series, which is alternate history, is amazing too. And then there are Nicola Griffiths Aud Torvingen mysteries: The Blue Place, Stay, and Always, which are so beautifully written; they really soak you in Aud's unique worldview. JM: You are a Canadian and legally married to your wife. Do you feel that the lack of civil rights for gays and lesbian in the United States colors queer literature there? The larger question being do you think oppression shapes a body of literature? AD: Interesting question! I have read more than one essay where Canadian SF writers try to define what it is that makes our fiction different from that written by U.S. authors. I don't know that I've ever seen a similar piece that focuses on queer writing. It's fair to say, though, that any artist is going to be affected by oppression, and that most of us probably couldn't keep that out of our work if we tried. For me, every little thing tied to the legalization of my marriage was profoundly affecting and memorable: the moment I realized the law was going to change within my lifetime, hearing the Supreme Court decision on CBC Radio, getting to go into a drug store a few days later to buy a marriage license for two women (like any other ordinary human being!) and of course the day itself, when Kelly and I exchanged vows with our family and friends present. I could go on and on. Everyone's wedding is earth shattering, unforgettable, and deeply emotional to them, I know. But being told you can have something that has been arbitrarily forbidden you your whole life, being allowed to exist... it's mindboggling. Does that have something to do with the fact that "The Riverboy," which was written before my legal marriage, has a gay-bashing in it, while "What Song the Sirens Sang," which came afterward, has an upbeat vision of a futuristic queer community? It's impossible to say. So many other things go into any given piece; we're never just one experience. JM: Many times in interviews with authors I ask what kind of advice you would give to others queer writers. Let's mix it up. What advice or guidance would you give to queer readers? AD: Besides a hearty "Thank you! ", for being into books and stories when there's so much else out there, mediawise? In my own reading, I know how easy it is to just hit 'my' sections of the bookstore--the history and political and SF shelves--and to fall into the rut of only looking for things that match my expectations. I'm not always delighted by what I find when I range out of my comfort zone, but I have made some of my best discoveries that way. So, on the theory that what works for one may work for more, that's my advice: prowl beyond your favorite shelves, at least now and then. You might find something new and remarkable. Awesome interview. Thanks for the insight into a relatively new female SF writer who happens to be queer. I thoroughly enjoyed reading Indigo Springs, and I look forward to the release of many more books from Ms. Dellamonica. Alyx, you are *so* well read and delightfully forthcoming. This would be why I love & admire you, as a woman, a writer and an amazing human being. Congratulations on the interview! It's a wonderful glimpse into your world. Rock on writer girl!